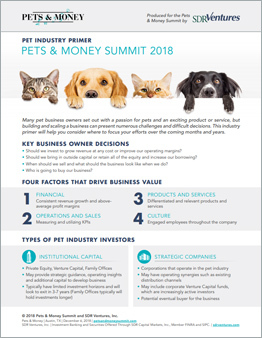 In anticipation of the inaugural Pets & Money Summit this December, we’ve prepared a pet industry primer that is designed to help pet business owners consider where to focus their efforts over the coming months and years. The guide is available for download here. The Pets & Money Summit is an exclusive one-day event on December 6, 2018 in Austin, TX. The Summit brings together growing pet brands and start-ups looking for investment or acquisition interest and those looking to partner with them – strategic and financial buyers, private equity, VC and angel investors. The event will showcase the latest innovations disrupting the industry, explore key trends and consumer priorities, and identify actionable strategies that owners can use to grow their business or secure their next acquisition target. The full event agenda can be accessed here. 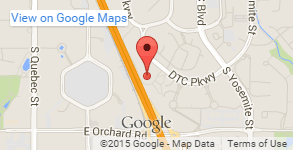 A 10% discount is available to SDR’s network by using the discount code SDRPM10. The primer also provides a pet M&A and investment snapshot including a breakdown of transactions by pet industry segment and key transactions over the past two years. SDR Vice President and Pet Industry Lead Jodi Burrows will be available for private meetings at the Pets & Money Summit. Please connect with Jodi at 720.221.9220 or jburrows@sdrventures.com.